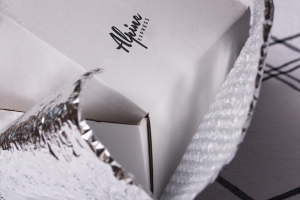 Q: What are Alpine Express cheese boxes? A: Alpine Express cheese boxes consist of a selection of cheese and accompaniments selected by our own Tom. All boards are designed to remove the complexity of finding and choosing cheese that match on a beautiful cheese board. Q: What is Alpine Express Cheese Selection? A: Alpine Express cheese selection is a selection of Swiss artisan cheese that you can order by the piece. So other than the cheese boxes, you can mix and match different cheeses and choose your size and accompaniments. It’s like being at a cheese deli counter. Q: How are these cheese boxes and cheese selection sent to me? A: All cheese boxes are sent individually, meaning they are wrapped in environmentally friendlier, insulated cardboard boxes along with wood wool for padding moisture and an ice pack to keep the content chilled during the transport. Unless agreed/communicated otherwise the shipping takes place with Australia Post Express delivery. Please check that your delivery postcode is part of this network. All boxes are adequately packed and insulated to meet the guaranteed service level of ‘next day delivery’. In case of a delayed delivery due to Australia Post’s fault, we cannot be taken responsible for the quality of the cheese. However, this thankfully does not happen very often. Q: When is cheese sent out? A: All orders are collated and sent out on Wednesdays unless notified otherwise (e.g. during public holidays, etc.). The order cut off time is the previous Sunday at midnight AEST for cheese boxes and 9am Sydney time on the day of dispatch for anything else. You can then expect your parcel to arrive on that Thursday. All orders will receive an Australia Post or Courier tracking code. Q: What is the shelf life of the cheese? A: All cheese supplied come with best before or use by dates and are generally vacuum packed for ease of transport and handling. They will have 1 to 2 months of shelf life. If you choose to have your cheese packed in cheese paper, the cheese will be dated with 2 to 3 weeks shelf life depending on type of cheese. Certain soft, fresh or blue cheese will have shorter dates but this will be stated on the product description. Generally dates on cheese are for guidance purposes only. Many cheeses can be enjoyed well after the printed date. If you are unsure, simply ask us. Q: Can I get more information about the cheese supplied? A: Of course, every cheese box order will be getting a detailed information sheet about the cheese supplied. Cheese selection cheese only comes with general information material, however each cheese is described fully on the product page. And if that’s still not enough, just drop us a line with your question and we’ll be happy to help. Q: Can you guarantee supply? A: Unfortunately not. Every now and then we will have to make substitutes for some of the cheese mentioned in the boxes description. We do, however, make sure you get an equal or better substitute. We will also inform you ahead of the shipment, so that you can let us know if you changed your mind. Q: Can I change some of the cheese in the cheese box? A: Unfortunately not, but please do let us know what combinations you would like to see and we’ll take those into account when we design future cheese boxes. If you like individual and/or mixed boxes of selected cheese, then our ‘cheese selection‘ area is the right spot for you. A: We strive to ship you cheese of superior quality every time. Should you, however, not be happy with what you received, please contact us and we’re sure we can sort it out. Q: What if I have a larger event or function and would like to purchase large quantities? A: We would be happy to help you out – please contact us for a consultation. Q: I live in Brisbane and would like to collect the cheese. Is that possible? A: Yes, if you live in the Brisbane metro area you are more than welcome to collect the cheese from our facilities in Wynnum (c/o The Small Crop, Shop 1, 210 West Av). You will only be presented with this option after you’ve added a 4xxx postcode during check-out. Once the order is received we will let you know the details. Generally you can pick-up the cheese from Wednesday mid afternoon of our order cycle and anytime after that as per opening hours of our partners, The Small Crop.